What is the best kind of wood for flooring under a long arm? We are finally moving! we have been searching for a new home 4 long years. So excited, I don't know what to pack first! For my quilting room there is a very large upstairs bedroom. It has carpet which will be replaced before we move in. I want a real durable surface, that is easy to clean. I am leaning toward a painted wood floor because I like the look. Once the long arm is set up, it will not be moved, so scratches aren't the issue, but dents might be. Painting the floor is not set in stone, and any suggestions for a non-denting flooring is appreciated. Congrats and enjoy your new home--and studio! Since it will be upstairs, I say use whatever flooring appeals to you. I don't know if Pergo or other "floating" flooring will be OK for the weight of the machine. Ask your local flooring experts what the maximum concentrated weight is for the flooring you choose, since the full weight will be on four points. You can protect the floor from dents by using furniture pads under the legs, I bet. Or even a piece of Masonite or other hard composition product can be put under the legs to spread the weight and avoid dents. As with any hard flooring, you'll want to find a suitable mat for standing at the longarm. There are many options online for chef's-grade runners or those used in industrial settings, that will fit the width of the frame. Be advised, they are pricey. I have carpet with a really good pad in my studio. It's dustier than a hard floor, but easy to vacuum and I deep clean twice a year. I'm sure others will chime in, especially those who started from scratch to outfit a studio. We have a Pergo type floor in my sewing room, and it is popping up at the seams from the weight and vibration of the machine (or so my husband says). It is not bad; I just noticed it last week and the floor has been down for almost two years. I would think the most durable flooring would be 3/4 inch nailed down hardwood. It isn't easy to install, however. The weight of the long arm won't bother it a bit. Any painted floor is going to show wear far faster in traffic areas than say a stained and varnished floor. I would choose a pre-finished nail down hardwood so that the new floor will match heights with the adjoining floor finishes. Your doors have been trimmed to clear the carpet and if you go with a thinner laminate you will have gaps under the doors and maybe under the baseboard depending on how the carpet was installed. The prefinished wood comes in all kinds of colors and I expect you will find something you like. I would love to have real hardwood floors in our house, but we have a concrete slab under our floors, so nothing to nail to. Salem MO. Middle of the Ozarks. Go with the real nail down wood that is what I have now and what is going in my new studio we do all our own installing it really isn't that hard but if you are not a wood worker have the company you buy your wood from for help in that area and I agree that if you paint it it will ware off really fast unless you polly over it. If you float the floor it seams to buckle and come up. Teresa all you have to do is put a sub- floor on top of the concrete slab and then lay the hard wood over the top. Any day that I get to quilt is a great day. My room is upstairs too and was totally carpeted. 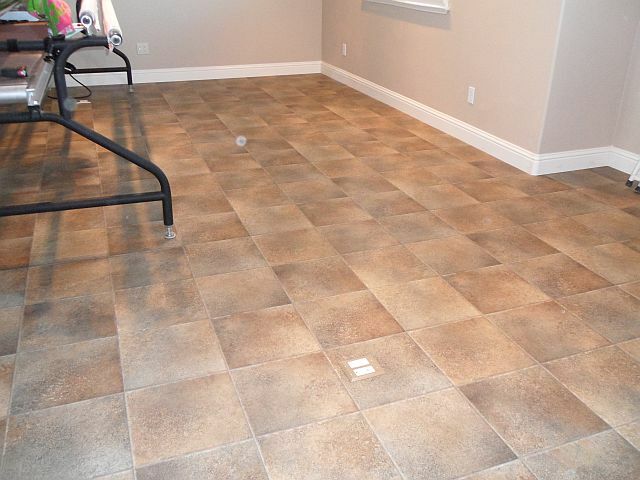 I had that removed and decided on some really nice vinyl flooring. I figured it would hold up to all the heavy stuff and you don't see that much of it anyway with all the stuff in there. It's easy to keep clean. I use the anti-fatigue mats Linda mentioned and I have things under the legs of my longarm to keep them from eventually cutting through the flooring (not shown in the picture). Which makes it easier to slide should I ever want to do that. I used the money I saved on the floor treatment to buy two really expensive Koala sewing cabinets. It was a good choice for me. Laminate may not be "real wood" but it can sure look like it. the bedroom and living room, and the whole house will have it, laundry and both baths, too! Easy to clean, a little vinegar in the water when mopping, will help it keep it's shine. Nice for asthma victims, copd, hiv and aids.. as well as other illnesses. Wow! All really great ideas. Thanks ladies. I've only seen this house once for about an hour. Since then, I've forgotton a lot about the individual rooms. It will be after the 19th before we can get back in to paint, clean and redo the upstairs flooring. Seems like a painted floor would not be a good choice, and although I love the look, but will not do it in the quilt room. All I can recall about the house is that Mom will have a terrific room with a view of the lake at the back, My kitchen will be small but since I don't cook much, that's ok. The master bath is not laid out well, and is a horrible design with way too much green tile, but hey, it's a bath! Our focus and requirements for the right house shifted to one that would work for Mom, now that she is totally dependent on me. 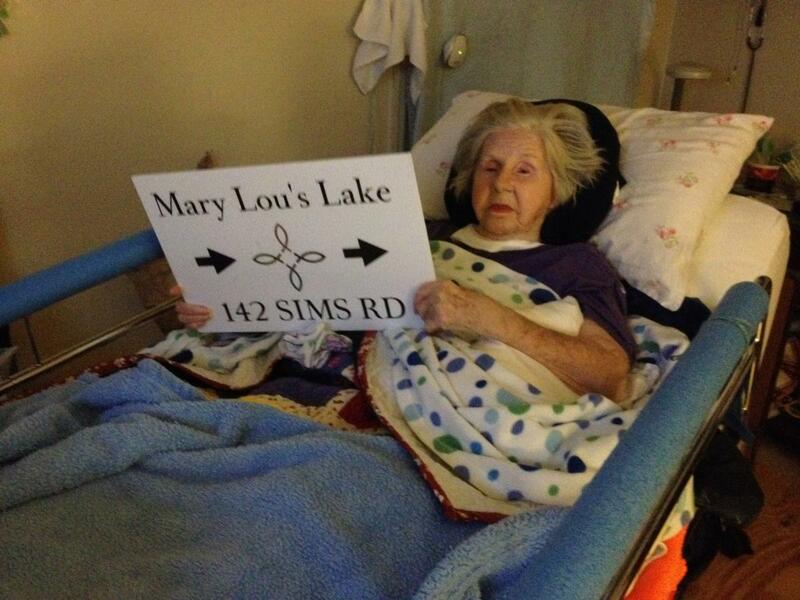 Hospice discharged her last feb,, so no help is available around here. Home nurses.....let's just say a referral was given to an agency last monday and we have yet to get a call from anyone..This house is only 12 miles from my youngest so she is planning on visiting often to assist with Mom's care. There is plenty of room, just has to be organized, and appearances can get fixed later. The one part of the house that I do want perfect besides Moms room, is my quilting room. If I have to be housebound the same as Mom, then at least I'll have an outlet so I don't loose my mind. Thanks for all the good suggetions. There will be pictures posted when all is completed. I have real hardwood under my machine and it has held up very well, no dents. I have found that the prefinished hardwood has held up much better to everything than the finish on site wood I have had in other houses. "Someday" we plan to finish our basement and move my longarm down there. 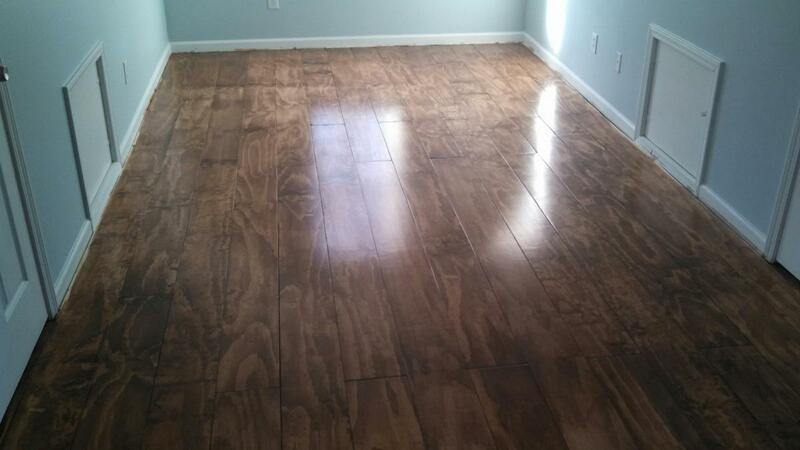 I would like the strip vinyl flooring that looks like wood. Used in may institutions. It is very sturdy, chairs roll on it with no problem, no scratches and it can be glued down to cement. Laminate flooring all the way. Mine has been in my studio over 11 years and no buckling or separatuon of any kind. Easiest no maintenance I've ever had. My studio is in the basement which was a concrete slab. We used a wooden subfloor system, 2 x 2 squares with a plastic raised barrier underneath. That keeps the coldness from the concrete away and was much softer. Over the subfloor we laid a laminate. I've had it now for probably 6 or 7 years and I've never had a problem at all. My legs don't get near as tired standing on this floor as they did when it was concrete and it is much warmer, although during a hot flash I really miss that cold concrete . I wasn't convinced that the subfloor was a necessity but now I'm glad hubby talked me into it. If you are wanting the painted floor look. Check out Armstrong's Painted Pine White Washed Luxury Vinyl Flooring Planks. I just put them in my studio and love the shabby chic look they give. Will have to ask DH to check this out. I have had my longarms on tile, hardwood, and now floating engineered wood. I see no difference. I have never had mine on carpet. But when visiting those same Millie owners who did have it on carpet, the machines were quieter. So might help to add a strip of carpet or rug to absorb the sound. Well, it looks like we are going to go with carpet in the upstairs rooms..DH wins this one. lol. He is in a hurry to get us moved and I can't convince him that the carpet is a pin magnet. I will just have to be very careful. Thank goodness, I do have a broom magnet picker-upper. 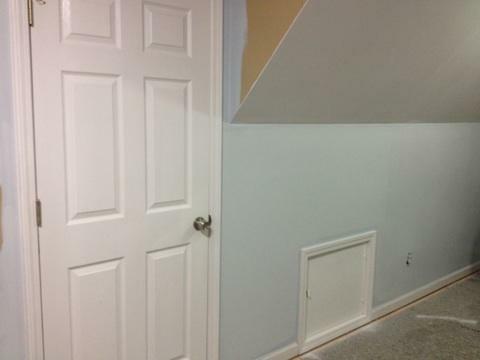 The painting should be finished today, carpet should be coming in sometime in the next week or so. I have not been able to go see the house or help with any of the work being done ((lucky me)). Below are 2 pictures my daughter sent me. What a beautiful home! Congratulations! I have carpent currently and although it is not my first choice in flooring for the sewing and longarm studio, I have done OK with it. My pins have the large flat heads so I can see them easily; and it's berber so relatively low loft. I love your rock work and front porch. How inviting! Guess I will change out my pins to the flower headed ones - thanks for the tip for using those. The picture of the blue wall color is the color of my new quilting room. When I asked DH tonight if he had shopped for the carpet yet, his reply was "nope". I told him he shouldn't give me so much information as it was likely to go over my head......lol. My daughters tell me that he has given strict instructions, they are not to tell me anything else, as he wants to surprise me with at least one thing. I am not really up to surprises just now. I only want to get this move over with!! Or at least, go see the house again. One hour is all I've spent there since we bought it in November. (sigh) I have my poor mom so geared up about moving she is just over the moon that we have named the back yard pond after her...She has some dementia, and forgets things a lot, even me sometimes, but she hasn't forgotten the "lake". Here is a picture of her last night with the sign I had made at Vistaprint for her... she was waving it at the TV set in her room. Said she wanted the people on the tv to see it. . I just hope she doesn't go bonkers when we finally move. Looks like a lovely house! Hopefully, you will soon have your move behind you and will be enjoying your new sewing room! Oh Debbie, it's beautiful! Lucky gal and what a great guy you have! Thanks Vickie! Moving won't be long now, at least not as long as it has been. DH used a furniture grade plywood cut into 8 inch boards. That shine you see, he says is 4 layers of varnish, with an allover sanding between each coat.. He is so good to me. Not sure it's deserved, but I love it. It's wonderful, Debbie, and built to last you years and years! Nothing like a genuine hardwood floor! !